With today’s colossal corporations that span the globe, it can be confusing to identify products that should be subject to BDS, the international campaign using Boycott, Divestment and Sanctions to compel Israel to abide by international law. One such product is Eden Springs Water. An Israeli company, Eden Springs delivers over 680 million litres of water across 18 countries, making it one of the world’s leading providers of bottled water in the workplace. Despite its name, however, this lucrative corporation did not begin as a pristine gift from nature; it began and continues to operate as an illegal occupation of the Golan Heights. Does Eden’s presence in Europe mean it is more global than Israeli and so should not be the target of BDS? Not in the least. Eden’s original factory remains in the Israeli-occupied Golan Heights, where it derives its very product from the expropriated Salukia Springs. While Eden does source from European springs for its European markets, Eden’s core website makes clear that its European business is merely an expansion of its Israeli success. The Bloomberg Business snapshot of Eden ­confirms that the company is headquartered in Israel and that it does business internationally. Does the investment of an American equity firm lessen the Israeli identity of Eden? On the contrary. The financial shuffling was an investment in an Israeli corporation, but also ultimately in Israeli doctrine. The founders and managing directors of Rhone Capital are billionaire financiers Robert Agostinelli and Steven Langman. Agostinelli is a leading supporter of Zionist causes and a founding member of the high-powered Friends of Israel Initiative, which asserts that “Israel’s future is our [Western] fate.” Similarly, Langman donated last year between $3000—9999 to Birthright Israel Foundation, an organisation which, partnered with the Israeli government, recruits potential citizens and supporters of Israel. With its roots in the Israeli-occupied Golan Heights, Eden stands as a prime example of Israel’s rapacious history. As far back as 1919, when a state of Israel was still in its planning stages, the Zionist Organization presented a statement to the Paris Peace Conference staking its claim on region­al water resources. The Zionists stressed the “vital importance” of securing and controlling water for their proposed state, and pointed to a stretch of land that easily included the present-day Golan Heights. Nonetheless, this portion of the land was absorbed into the French Mandate, and later, upon Syrian independence from the Mandate, declared Syrian. Israel maintained a military occupation for over a decade, and then announced it was annexing the territory as Israeli. Syria, of course, took the issue repeatedly to the UN (for instance S/9489). Time and again, the UN ruled that the seizure of the Golan Heights violated international law. Israel simply ignored the UN censures (for instance 35/122, 35/207, 35/674). Upon the unanimous adoption of Resolution 497—even the US agreed the annexation was illegal— the Israeli Representative to the UN immediately dismissed the international ruling; he stated on the record: “Israel cannot and does not accept the resolution just adopted” (S/PV.2319). And so Israel has not budged. Its Ministry of Tourism boldly proclaims the land as “Israel’s mountainous northern region,” and Israel continues to benefit from the natural resources of the Golan Heights. The UN has recently trotted out the same old condemnations (A/RES/70/91). After nearly 50 years of diplomatic denouncement, though, it has become glaringly obvious that piracy has prevailed. The treasure of the Golan Heights was taken by force and by disdain for the rule of law. It is hardly surprising, then, that Eden’s website states that it contributes to the Israeli military forces, the IDF. Eden Springs makes a mockery of international law and washes away hope for respectful co-existence. With an absurd twist, in 2012 Eden Springs was granted a contract to supply bottled water to the World Health Organization headquarters in Geneva (source one and source two). WHO is, of course, the “public health arm” of the United Nations. Researchers with BDSlist.org contacted both WHO and Eden Springs. To date, WHO has not responded. Eden Springs Switzerland confirmed that Eden supplies events organized by WHO, particularly the annual week-long World Health Assembly. It is nonsensical that an agency of the UN should be contracting with a corporation built on violations that the UN has consistently denounced. A petition requesting that WHO terminate its business relationship with Eden Springs can be found here. 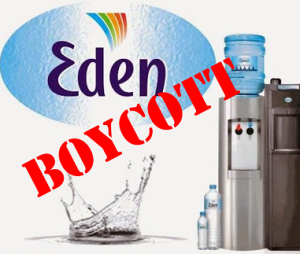 Every purchase of Eden Water normalizes an illegal settlement and exploits the most precious natural resource that lawfully belongs to the Syrians. The time for boycott of Eden Springs is now.